DICÒ, born in Rome in 1964, received his artistic training at Rome’s Institute of Art on Via Ripetta. He began to attend artists’ studios and workshops, where he absorbed a variety of influences, from the materic to the figurative, and from the geometric to the conceptual. All of this was to help him in his early artistic experiments, an extremely diverse range of works. He was especially fascinated by the vast array of experiences and materials present on the Rome art scene at the time. Meanwhile, he discovered new opportunities in advertising and successfully dedicated himself to commercial graphic design, an experience that would prove immensely useful to his later forms of aesthetic expression. Curious and multi-talented by nature, he felt the need to broaden his creative horizons and traveled to America where he would later lice, sometimes for long periods. Pop Art became his favorite point of reference, and all the innovative color and visual influences that he absorbed would shortly come together to create his own original creative style. After returning to Rome, he fully immersed himself in experimenting with new techniques and materials, and in doing so he developed what would become his signature style from moment on: the combustion of Plexi-glas. A regenerative synthesis that allows him to breathe new life and new meaning into contemporary legends. In 2012, DICÒ had a chance encounter with Galleria Cà D’Oro’s Gloria Porcella and Lamberto Petrecca, which had an immediate and innovative impact on his work. He took part in the collective exhibition, Homage to Marilyn, organized by two curators in Rome and Miami for the 50th anniversary of the star’s death, where he exhibited his first Marilyn created using the new technique. The show included works by Andy Warhol, Mimmo Rotella, Pablo Echaurren and thirty other contemporary artists. He received a great deal of attention from the public and critics, and immediately gained a reputation as a cutting-edge artist in both Italy and America. The collaboration with Cà D’Oro continued, and in 2013 he took part in another large group show, Homage to Verdi, for the bicentenary of the great composer’s birth. The exhibition was organized by Petrecca and Porcella for two venues, Rome’s Auditorium Conciliazione and Miami’s Galleria Cà D’Oro. DICÒ was the only artist display four works in the exhibition. He exhibited four portraits on black backgrounds with burnt edges, depicting Giuseppe Verdi, Pavarotti, Maria Callas and Riccardo Muti. He then exhibited in the Close-Up of Rome show in the historic venue of the Galleria Cà D’Oro in Piazza di Spagna. He was joined by Sigfrido Oliva and Barbara Bouchet, and it was in this exhibition that his paintings began to no longer portray just a person, but also a city or a symbolic monument – always legendary, of course. Starting with the Colosseum which he exhibited in this show, he continued with the skyline of New York during the tragic explosion of the Twin Towers, and finally his large depictions of Eiffel Tower embellished with neon, iron logs and other waste materials. He was invited by the Italian Embassy in Monte Carlo to exhibit in the Principality of Monaco for two years running during the Month of Culture. Subsequently, two of his works were displayed at Barclays Bank. DICÒ participated in exhibitions at the Macro Museum of Contemporary Art in Testaccio, at the Crocetti Museum, and at the MDM Museum of Contemporary Art in Porto Cervo. In the interim, Teo Mammucari – a television host, old friend, and one of his first supporters – introduced him to a number of media and sports figures. 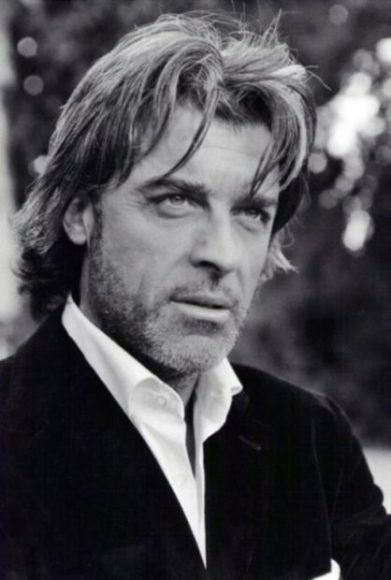 The number of celebrities wishing to feature in a portrait by DICÒ began to skyrocket: from Diesel’s Renzo Rosso to Renato Balestra, from Matteo Marzotto to Keanu Reeves, from Penelope Cruz to Morgan Freeman, from Antonio Banderas to Luisa Ranieri, and from Javier Bardem to a great many more. In his work with fire, always in search of a never-ending dynamic and creative impulse, DICÒ instigates genuine “blitzes” by opening and closing innovative temporary art galleries in the spaces of a few months. In the spaces – from Via Margutta to Via del Babuino, all the way through to Piazza Montecitorio – he exhibited his work, each time receiving accolades from a cross-section of people, from museum and gallery professionals to normal people passing by, and from famous soccer stars to illustrious professors. His works now take pride of place in the private collections of renowned figures in the fields of cultures, performing arts, finance and sports, both in Italy and overseas. His retrospective exhibitions, COMBUSTION, will take place in Rome’s Complesso Vittoriano, starting on June 7, 2017. It covers DICÒ artistic career up to the present, and also sets the stage for new exhibitions and new artistic achievements. Copyright © 2018 DICÒ ART - THE FIRE ARTIST All right reserved.